DISCOVER THE AMAZING NEW GOLF SWING CHANGE THAT WILL HELP YOU Add 30+ Yards To Your Drive AND VIRTUALLY ELIMINATE YOUR NUMBER ONE PROBLEM THAT'S PLAGUING YOUR GAME! Was a personal protégé of Dan Shauger who taught me the swing of and introduced me to the late Mike Austin, who holds the Guiness Book Of World Records entry for the longest drive in the history of golf with 515 yards, with a persimmon (wooden) driver! You're Going To Discover How To Master Swing Speed! Swing speed is the one thing you can improve upon the fastest regardless of age and it doesn't even matter whether you're athletic or not. When You hear all the world's top golfers talk about something all the time you know it has to be something important. Well, some call it club speed and some call it swing speed, but as everyone knows it's a super hot topic amongst the Pro's! Now let's take a look at some super interesting and specific numbers. you get, the longer your drives will be. HOW FAR COULD YOU DRIVE IT? And: Despite what many teaching Pro's, and even Tiger believe, yes, you can actually discover the technique that will increase your swing speed easily at any age! But... those guys are all super-fit. Do I have to be as fit as Tiger or Camilo Villegas to increase my swing speed? No, absolutely not. Just look at Camilo Villegas and John Daly. Camilo is one of the fittest players on tour. John is, well, not, but he still outdrives Camilo by a solid 4 mph. "Dear Mr. Bowden, I have purchased your program and after only two weeks. 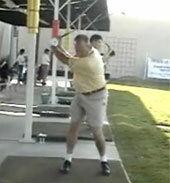 I am 65 years old and before starting your program my average speed was between 85 and 88. I am now averaging 88 to 91 ....But..I have recorded one swing at 99 mph and the ball was out or sight.....WOW. I have recorded 4 drives on the course of 260 to 280....yes I said 280. It was a feat but my buddies are already talking about making me tee off the blue tees." "The video on ... is the most effective instruction I've ever had!! I'm 72 y/o and have never known my swing until now. I used to shoot low, now and then,but quit for 15 yrs. Last year I started again and could not break 95 until this very informative video. Now, I'm scoring in the low 80's or better from the intermediate tees. (I also have had back surgery for spinal stenosis) Thanks for a great lesson." "I have been into your teaching for a about 5 weeks have gained 30 yards... I am in my 60s." Yes, I chose these specific testimonies because these guys are all well over 60, but we literally have hundreds of real testimonials, from 12 years olds to guys in their late 80s, with handicaps from 30+ all the way to Pro. On average, all my students constantly add 12-16 mph of driver swing speed and 30-40 yards to their drives in their first month in just 10 minutes twice per week. Yes, those are fast results, but those are just the averages. Quite a few people, like one gentleman who is over 58 years old actually gained over 30 mph, which translates to an astounding 75 yards in greater distance! I could go on and on and tell you about more of the thousands of long driving customers from around the globe that have already achieved these gains in distance with little to no work on their part at all. 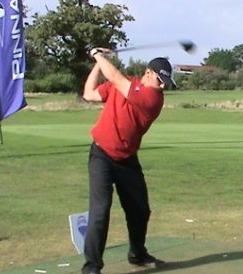 Do I have to change my Golf Swing? Absolutely not. The Swingman Golf Training System consist merely of a few very subtle changes in technique, where you simply make small adjustments to your warm up and training. All stuff that you can easily do in 10 minutes only twice a week. Never again will you have to fear slices and hooks when you finally uncover the insights of "Club Awareness"
You'll have far more straightforward short iron approach shots & reach many more greens in regulation! It's a simple and clear system of instructions, that took me more than 10 years of dedication, trial and error and sweating, so you don't have too. With the one goal of perfecting the technique of rapidly gaining super swing speed that could then easily be taught to any golfer at any level regardless of their age or experience. It's a living and breathing online membership system, that constantly gets updated, and is always immediately accessible wherever you are even when you're traveling for business, vacation or retirement. No matter where you are it's always right there when you need it. This is NOT a DVD that comes by mail in a few weeks, when you have forgotten that you even ordered it, and that's outdated within a few months. This is not some crazy way to try and sell you a bunch of golf gadgets you really don't need and that only end up in a garage sale somewhere. Everything you need to perfect this system you already have. This is not one of those ultra boring workout routines that has you driving to the gym and spending hours on useless movements that never really translate to golf anyway. This is the one thing you can do in only 10 minutes just twice a week. It sometimes feels like the golfing community is the very last bastion of real gentlemen, a secret brotherhood where politeness, honor and effort still really mean something, classic, even a bit old fashioned, but in the best possible way. It's Never Been Easier to Take Your Golf Game To A Whole New Level! You will instantly be connected to the #1 Swing Speed Program in the World! Seconds after registration you will get your member login for unlimited 24/7 access to Swing Man Golf and it's unparalleled Swing Speed Program. You'll have global access so no matter where you travel around the world it will be their when you need it. You will get over 50 pages of super simple well laid out instructions, beautiful graphical guides and short and easy to understand video content. More than 60 minutes of simple and clear, easy to follow audio-visual Instructions. Over 125 pictures showing you all various positions and techniques of the golf swing. Access to a highly reputable Club Maker & Fitter Locator Tool. FREE unlimited access to all future content and updates. 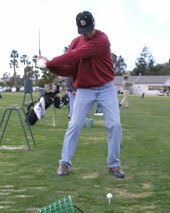 20% OFF on ALL in-person Golf Instruction Training with Jaacob. Personal, unlimited access to me, for any questions you might have during the whole process. World class customer service and MUCH MORE! And, When You Get Access By Saturday, April 20th 2019 You'll Also Receive: 5 Special All-Access Bonuses! As Soon As You Gain Your Instant Access You'll Start Loving Your Long Ball Shot's More Than Mere Words Can Even Describe.